Xpressions'15 - The Annual Management-Cultural fest of XIMB, ends with a bang! 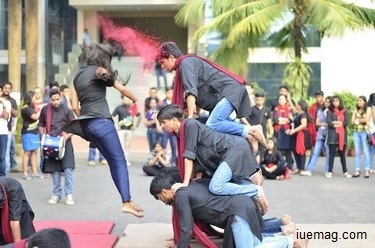 The annual Cultural fest of XIMB was successful in organizing a plethora of events, which resulted with a lot of fun, entertainment and learnings. Inspiration Unlimited eMagazine was glad to partner with XIMB as the 'Online Media Partner' for the event. Here is what 'Xpressions'15' expresses. Read on! “Xpressions’15”, the flagship Management-Cultural fest of Xavier Institute of Management, Bhubaneswar, concluded successfully on 15th November 2015. Spread over three days - 13th, 14th and 15th of November, 2015, the fest witnessed a huge number of participants from reputed colleges such as XLRI, IIM Bangalore, IIM Shillong, Great Lakes Institute Of Management, IMI Delhi, MDI Gurgaon, etc. 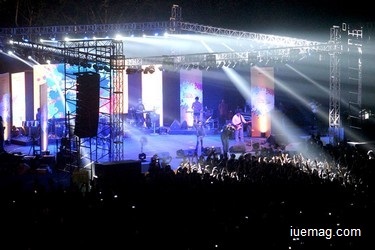 Around 3000 students participated in various events such as Gladiator, Helios, Goonj, Aaghaz etc, and the final night, which had the Vishal-Shekhar concert, saw a footfall of more than 20,000 people. Each day had a plethora of different events, where there was something for everyone. Day 1 saw many events taking place. The first rounds of various gaming events such as Gladiators, Kurukshetra, Skill City and Helios, saw participation from various colleges such as KIIT, ITER, VSSUT, NLU Cuttack, Silicon Institute of Technology, etc. These events, which require extreme skill and acumen, were intensely contested by the participants. The preliminary round of Goonj, the singing competition also took place on Day 1 and witnessed spellbinding performances by students from colleges such as OEC, BIMTECH, Centurion University, Srusti University, etc. The first Model United Nations conducted by XIMB also began on day 1. Participants from schools and colleges such as ODM Public School, KIIT, SAI International, OUAT, NLU, Christ University etc, engaged in stimulating debates and discussions of Global issues, in an attempt to find feasible solutions. Paint@XIMB, the painting competition, unleashed the creativity and artistic skills of participants from universities like BK College of Arts and Crafts, CET, JD Institute of Fashion Technology etc. The preliminary rounds of Inquizzitive, the Quiz Contest, Nirnay, the operations case study competition, Case in Point, the HR case study challenge, Case Connect, the management based case study event, and Parikrama, the online treasure hunt, also took place on Day 1, in which students from various colleges participated. One of the most interesting events of Xpressions'15 was NBA JAM, a unique 3 on 3 basketball event, where around 160 teams from various schools and colleges such as KIIT international school, IIIT, DAV, Sri Sri University, and many more, participated. The qualifiers were held on Day 1, when VJ Ranvijay visited the event and enthralled the crowds. He lauded Bhubaneswar for being one of the most clean cities in India and said that he had a superb time at NBA JAM in XIMB. The highlight of Day 1 was Decibelz, the battle of the Bands, which witnessed powerful and highly entertaining performances from bands such as Knight Shades, Grails of Destruction, Intoxicate, Orphic Cosmogony, Annihilate the Reich. The event was judged by the lead vocalist and rhythm guitarist of "Demonic Resurrection", Mr. Sahil Makhija. "Intoxicate", the metal band from Kolkata, walked away with the first prize. Speaking about his experience at Xpressions'15, Sahil Makhija appreciated the bands that performed in Decibelz and their efforts to make good music. "You can see the passion in the bands when they play, there is that 100%!" he remarked, regardless of the number of the people in the audience. The night ended with a rocking performance by DJ Nucleya which had the crowd dancing to his tunes to his popular tracks such as Akkad Bakkad, Laung Gawacha, etc. While Day 1 ensured that the event started with a bang, Day 2 ensured that the fun and excitement increased. Flight of Fancy, the literary contest, saw unique and extremely creative entries while Xpressions in 60 seconds, the RJ hunt, conducted in association with Radio Choklate, was a real crowd puller. The finals of Case in Point took place and saw the most brilliant minds being rewarded for their impressive submissions. 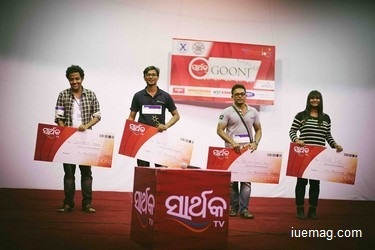 The finals of Goonj also took place, where the audience was treated to melodious and pitch perfect performances. The finals of ‘Maven’, ‘MPower’, ‘Inquizzitive’, ‘Xpress’, ‘Around the world in 80 days’ and ‘Kurukshetra’ also took place. Pratibimb, the face painting competition of XIMB, gave participants a unique way to express themselves. MUN also concluded on Day 2. The final rounds of the intensely contested NBA JAM took place where "Telugu Titans" won in the men's category, and "Powerpuff Bulls" won in the women's category. The day concluded with the much awaited fashion show, Carnival De Vogue. Participants from KIIT, Silicon Institute of Technology and ITER, apart from XIMB, put their most fashionable foot forward. The glamorous event was judged by model Ankita Chakraborty, beauty queen Harshita Naidu and fashion designer Abhishek Dutta. Day 3 witnessed many interesting events too, with an interaction with famous author Ruskin Bond being one of them. Virasat, the classical dance and music event took place which added a very Indian flavor to the proceedings. The Final Cut, the short film contest also took place. The event was judged by renowned film maker Mr. Susant Misra and the theme was "When Darkness Falls". Gladiator, Skill City and Helios concluded after many high intensity rounds. Thirkan, the dance competition, saw some high energy and mind blowing performances by participating teams and was judged by popular Odia actor Debashish Patra, Itishree devi, a classical dancer and Babubhai Ollywood, acclaimed choreographer. Aaghaz, the street play competition was an absolute delight to watch, with socially awakening performances from participating teams leaving a huge impact on the audience. The event concluded with the highly awaited and anticipated concert by famous singers and music directors Vishal-Shekhar. Vishal and Shekhar said that they had completed 17 years as a duo, and thanked their fans for all their love and support and also appreciated the massive crowd of more than 20,000 people for coming to their show. The concert witnessed a packed house and Vishal-Shekhar treated the audience to their all time hits like Chammak Challo, Om Shanti Om, Dance Basanti, Tu Meri, etc. The electrifying duo had the audiences jumping and dancing with their high energy performance, making sure that the fest ended on a high note. Any facts, figures or references stated here are made by the author & don't reflect the endorsement of iU at all times unless otherwise drafted by official staff at iU. This article was first published here on 24th November 2015.